RED HAT is up approximately 5% after market close. It delivered its financial results a few hours ago. 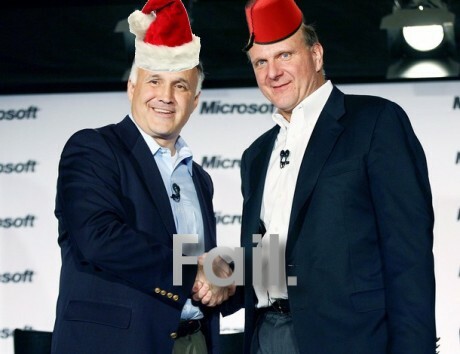 The stock has reached a very high value, despite Ron Hovsepian and Steve Ballmer (seen above) signing what several Web sites described as an “anti-Red Hat deal” or anti-Red Hat pact. Novell recently lost more than $200,000,000, Microsoft is shrinking rapidly. and Red Hat is reportedly growing, which means that expenses do too. Given the recent developments, Novell will carry on going "downhill", whereas its main rival, Red Hat, has good news for investors as its value soars. Open source solutions provider Red Hat Inc. (RHT: News ) is set to announce its third-quarter results after the market close Tuesday. On average, 21 analysts polled by Thomson Reuters expect a profit of $0.16 per share for the quarter on sales of $188.29 million. Analysts’ forecast typically excludes one-time items. Red Hat Inc. (RHT) reports earnings on Tuesday and is trading right at fresh highs. Thomson Reuters has estimates pegged at $0.16 EPS and $188.49 million in revenues, and while this used to be a takeover target the valuations are now very high and this one almost certainly has to really beat estimates and raise guidance to keep everyone happy. Red Hat /quotes/comstock/13*!rht/quotes/nls/rht (RHT 31.35, +1.48, +4.96%) is estimated to report a profit of 16 cents a share in the third quarter, according to analysts surveyed by Thomson Reuters. Red Hat Inc (RHT.N) reported higher than-expected profit as the business software maker posted strong growth in the sales of its version of the Linux operating system, sending its stock up 3.5 percent. Nice one Roy, ever heard of “lie by ommision”. You post on how well RH is doing, that’s good. If they were a software company that can be compared to other companies. But RH (as you know) does not “sell” software, they sell support contracts, open you’re phone book and you will find a million similar companies. As for RH being a star well, lets look at the real facts of RH, you can do this as well Roy it appears you know how to use Yahoo Finance. NOW: 22 Dec 2009 and you think ………$29.37 is good ??? 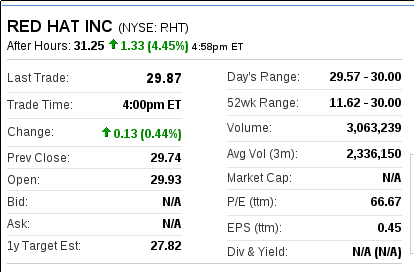 So if you invested in RH when it listed you are still DOWN a significant amount. You could of purchased RH shares when they were $3.50 and you would have made a bit of scratch but you risked losing it all if RH failed, (as it very nearly did). In conclusion, RH is not doing that well at all, and they dont sell software, they are just one of millions of IT support companies. That are a “dime a dozen” if you just open your phone book and have a look. But Roy, we all know you dont really care for the full story, or the real truth do you ? Are you happy on IRC now you have weeded out anyone who does not agree with you and follow you’re doctrine ? Im sure the chat is exciting now. And reading your IRC, I find you “thought” up the idea of using the speed of light to measure distance… Wow, who would of thought !. Read much science Roy ? Ha ha. The point was to compare Red Hat to Novell, a software company that once dominated corporate networking but is also a services company that flirted with free software. It might be more appropriate to compare Red Hat with Novell’s sugar daddy, Microsoft. It seems like only yesterday that Microsoft came crashing down with the other dotcom bombs but their glory days were a full twelve years ago and they never did anything good for investors. How many pension plans squandered their hard earned money on $60 shares of MSFT to have it worth half of that today? That loss is before you adjust for inflation. What’s responsible for this? Could it be that Microsoft offers few goods or services that people actually want, or that the market for software in a box is about as dead as newsprint? Could it be that Red Hat is doing well because they are offering things that people want? You fail to mention that MSFT had a stock split some years ago. (if you dont know what that means, look it up). But lets do a similar comparison to MS if you like, you’re favorate whipping boy. Stock split ~$60 buys 2xMSFT shares so you dividend and markings are 2x previou. Multiply that because you have 2 shares for every one means you have 2x $30 shares, totaling a little over $61 dollars real value assuming you sold. So Microsoft is NOT repeat NOT going down, if you think it is you dont understand finance at all. (or you believe Roy). so if you buy MS shares at $0.0955 and sell 2 of them at $61 dollars total what kind of profit do you think you would make ? Im sure it’s ALOT, compared to Red Hat the $1000 you invest in RH or the $1000 dollars you invest in MS. One would make you a millionair the other you have done you money. It’s does nothing for Roy credibility to make claims about how poorly MS is going when it’s clear for everyone who cares to look knows full well Roy is not quite telling the truth. But do a bit of research, and consider not everything Roy says is true, use you’re own brain instead of being spoon fed by Swestowits. Makes you look as uninformed as he appears to be. If you dont agree with me, I wonder about your ability to count. (or you’ve been believing Roy for way too long). If you would like to dispute my FACTS feel free, I would be interested to see you’re positive spin. But if you’re going to comment (Roy) on business and finance it would be a good idea for you to actually know what your talking about. you know, take the effort to actually find FACTS. Instead of just making it up to sound good. You commented once people dont want facts they just want sound bites. Again sound bites not based on facts meets the definition of an outright lie. And selectively “editing” and lying by omission is exactly the same thing. When everything (or most things) you say are clearly untrue, people do not know and cannot tell if you ever tell the truth. Like crying wolf eventually people will just ignore you. Sooner or later you will say something that someone else does not agree with, and if you cannot ban them you will just disregard them, or they will disregard you. So many posts, so many years and so little effect. Except to show people what you are really like, and what you’re real agenders are. Back on topic, I invite anyone to check Roy’s “facts” for yourself, YOU do the math and use your own mighty brain. If you still agree with Roy’s conclusions so be it, but Roy’s conclusions are not based on fact. As you can clearly see. MSFT has had 9 (thats right 9) STOCK SPLITS since it listed. if you purchased ONE MSFT share for $0.0955 in 1986 you would have 288 shares of MSFT valued at ~$31.00 each. $8928 dollars worth of MSFT shares (288 of them) for your 10cent investment !!!.. So you think MSFT is doing bad, sure I would have loved to have invested $10 on MSFT stock in 1986. So you $10 dollar investment, is worth the best part of a million dollars today. Not bad. Or you could spend $42 on RHT, and now have $32, you’ve LOST $10 dollars. Not made you’re self a million. $12 dollars in 1986 would make you over 1 million dollars in profit if you sold your shares today. You do the math, and find out THETRUTH for yourself. Q. How does a 2-for-1 stock split actually work? A. A 2-for-1 split means the investor will have twice as many shares as he had before, at half the market price. Here’s an example: As of the record date (January 27, 2003) if an investor owns 100 shares of MSFT and the market price is $50.00/share, that investor’s total value is $5,000.00. After the split, the investor will have 200 shares of stock, but the market price will be approximately $25.00/share. The investor’s total investment value in MSFT remains the same at $5,000.00 until the stock price moves up or down. Q. Why did you split the stock now? A. The decision to split the stock was made by Microsoft’s Board of Directors, based on a desire to make our stock more accessible to a broader range of investors. Q. How many times have you split the stock? A. This is the ninth time the company has split the stock since Microsoft went public back in March 1986. One original share will equal 288 shares after this split is effective. So if you have of invested $120 dollars in MSFT in 1986 you would be a multi-millionair, in your own mansion, with a bank of the fastest computers you can buy, nice car, and retired doing what you like. All for less than the price of a night out for dinner !!. So it would seem creating a product that people like to use, that does the job and that people can use to get the job done and be productive. People will happily pay for product that they want to use, be it RAM, CPU’s, Hard drives and even the operating system. You accuse MS of all sorts of bad things, usually unsupported but you fail to note some of the clear facts that MS is doing very well and has made people alot of money, it’s employed people for many years, given them jobs and income. They contribute to commerce and the world economy. And they do it all by creating and selling product that most (the VERY VAST majority) like to use as it just works for them. Roy’s hate of anything that is not OSS, does not mean he speaks the truth or has any understanding of how the real world actually works. It’s all just hate talk and venom, with the thinking that if you throw enough mud some will stick. Troubleis you seem to be getting more mud on yourself than on anyone else. When 5 seconds of searching shows you’re “facts” to be completely false, or at the least, to be as nice as possible misleading. …that is in todays money. So if you bought RHT and MSFT at their respective peaks, you’d have lost more on the MSFT trade. Not that MSFT and RHT are really comparable anyway, if for no other reason than size, but your assertion that “they are just one of millions of IT support companies.” was amusing. It’s just one of the most disruptive trolls, called Mutex (and about 50 more nyms). He currently uses a nickname that Orwell would love, “TheTruth”. Yes, I know how a stock split works, as the example stated explains. If you have one share worth $50, at the time of the split, you end up with two shares with $25 dollars. It does not change the fact that if you purchased 1 share in 1986, after the 9 share splits you would own 288 shares for the same outlay, A stock split does not change the overall value of a company, but it changes the number of shares you own for your outlay, you dont make any money from the split, but you have 2 times the potention for profit (or loss) of those shares. However, you spin it, investing in MS is a far better idea than investing in RH, and Novell is also better than RH, but not as good as MS.
As for you Roy, as usual, you have nothing good to say, You say im disruptive for providing the facts you wish to omit. Im sure you dont like being shown to be a straight out lier. But I just check your “facts” and it’s so easy to catch you out with what you do. But as usual, you will not enter into a logical debate about subject, you would rather “preach” to your “diciples”. You know the ones that hang off your every word and think you are some kind of demi-god. At least they dont check your facts. and Call BS when they see it. I guess all the life skills you need is what you get from hanging out on BN IRC 24/7. It’s not like you actually have any life experience, or even a job !! It’s just when you lie all the time Roy, people wont believe you even if you do say something that resembles THETRUTH. and as for Trolling, you would have to be the greatest troll of them all, what else do you do, but troll the web for tidbits agaist MS and spam your web site with you’re trolling results. You must have a miserable existance Roy, living burried deep in hate and bitterness as you do. Hmph. The worthlessness of Microsoft stocks seems to be a sore spot for you. How much of your savings have you lost to that company?